Recently Microsoft introduced Windows Mobile 6.1, a new minor version of the Windows Mobile operating system. It adds new features and capabilities on to the prior 6.0 version enhancing your web browsing and day to day use of Windows Mobile. The article Microsoft Supports the Enterprise with Windows Mobile 6.1 covers the new features for enterprise users. Now with the new Getting Started icon, new users to Windows Mobile can learn about the features and capabilities of their device. Getting Started is always available in the Programs and allows users to select the area they are interested in getting assistance with including: Make a Call, Set Date and Time, Setup e-mail, Setup a password, Setup Bluetooth, Set Background, etc. 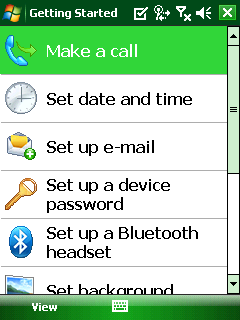 New with Windows Mobile 6.1 is the Today screen’s sliding menu for Windows Mobile Standard devices only. As you run applications the menu will grow in length to display the last five applications you ran. The sliding menu gives you the ability to identify the applications by icon or name rather than Icon only in the old 6 button format. One of the new features that is very cool is the ability to open a website in Pocket Internet Explorer and view the whole site as a thumbnail. In this view, the user has the ability to move a box that is the size of the web browser window across the thumbnail to select the area they wish to view. Keep in mind that you will have to wait until the whole webpage is downloaded before being able to view the thumbnail! This may be especially painful for users on slower cellular networks like GPRS. 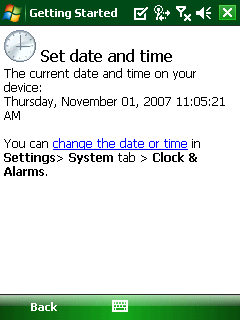 Now with Windows Mobile 6.1 Standard there are two additional alarms. You can access them in Start – Settings – Clock & Alarms. These alarms work exactly like the original alarm did. With Windows Mobile 6.1, Microsoft added a Task Manager. The Task Manager is similar to the one on your desktop PC. It allows you to see the list of running applications, the amount of ram they are using and the amount of CPU they are using. You can sort on the ram or CPU as well. In addition you can easily select an application and terminate it. Be careful terminating applications because they may have information that is not saved. You may wish to close some applications normally such as Word Mobile and Excel Mobile to avoid losing data. The new Task Manager application as seen on a touch screen device (Windows Mobile Professional). 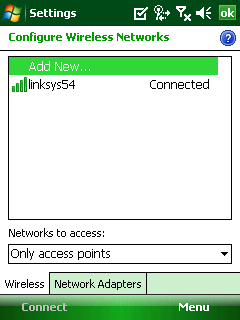 If your Windows Mobile device uses Microsoft’s Wi-Fi configuration utility, you now have additional capabilities. Microsoft added the ability to configure the Wi-Fi network you are connected to as well as identify whether the network is connected to the internet or work. 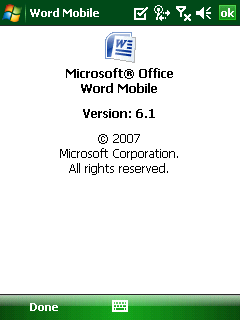 Along with Windows Mobile 6.1 Microsoft included the Office Mobile 6.1 update in rom. The major feature of Office Mobile 6.1 is the ability to save documents in the new Office 2007 format. However you lose the ability to save in the Word Mobile in text and Excel in 2003-2000 formats. Word Mobile 6.1 about screen. Each Windows Mobile 6.1 upgrade is a new rom. The upgrade is solely available from the oem or carrier that sold the Windows Mobile device. 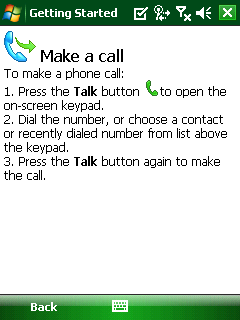 Some carriers and OEMs have announced rom upgrades for devices such as the ATT Tilt, ATT Blackjack II ( http://www.microsoft.com/windowsmobile/mobiledevicemanager/default.mspx ) HTC TyTn II ( http://www.microsoft.com/presspass/press/2007/oct07/10-23CTIA2007PR.mspx ) and the Treo 750 ( http://www.palm.com/us/company/pr/2007/102307b.html ). You will need to check with your OEM or carrier to see if your Windows Mobile 6.0 device will offer a rom upgrade to 6.1. With these new features, Windows Mobile 6.1 builds on the capabilities of 6.0 to make it an even better user experience. I expect that many users will really like the new web browser thumbnail approach because it allows the user to see the whole site at one time in the same format as the web appears on their desktop. The Getting Started looks like it will really help beginners get their feet wet and quickly come up to speed on Windows Mobile.